This piece was created for a very spiritual woman, commissioned by her partner. It is a piece of sacred art made to be used in ceremony and ritual. The image was created through a series of meditations over this summer of 2018, and is for me not only the archetypal wild goddess of the moon, but the wild goddess of Dartmoor! It is she I connect with deeply when on Scorhill, Bonehill or Hound Tor, it is she that I call when I need courage, energy and to feel at ease. It is she who embodies the ancestors. It is she who shows me the way into the cave of stars where I can rest on a bed of moss in a beam of warm white light, inviting me to be filled with love and healing. 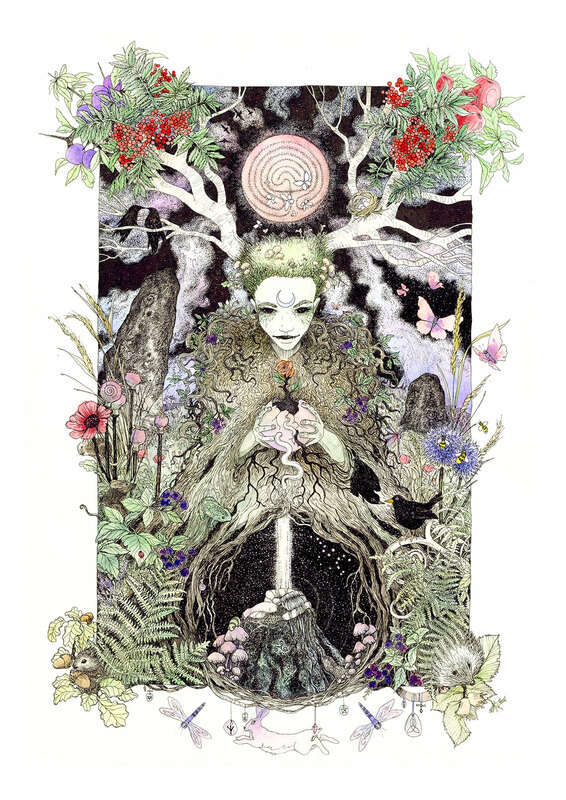 The Goddess: she is the wild goddess full of adventure and courage, she loves to wander and everywhere she goes she plants seeds to grow, nurturing the earth she treads and interconnects every tree and rock and stream. As she walks the sacred ways she brings with her the mysteries of moonlit nights, she is from the wild lands and moves with the rhythms of the moon. Even as she wanders she will always return on moon washed nights, to hunt and dance with the ancestors, on Tors, at springs and down in the Coombs. 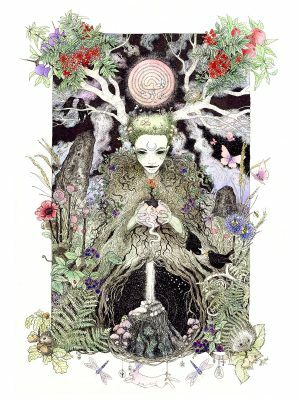 Here at home in the wild lands, the moorlands, she is the Wild Goddess, as hunter in and protector of the wilderness, she is the eternal cycle of life and death and rebirth. So as I look up to the moon and touch the ground the wild goddess speaks to me, as above so below, you are always beloved of the land, feel peace, thrive and grow.